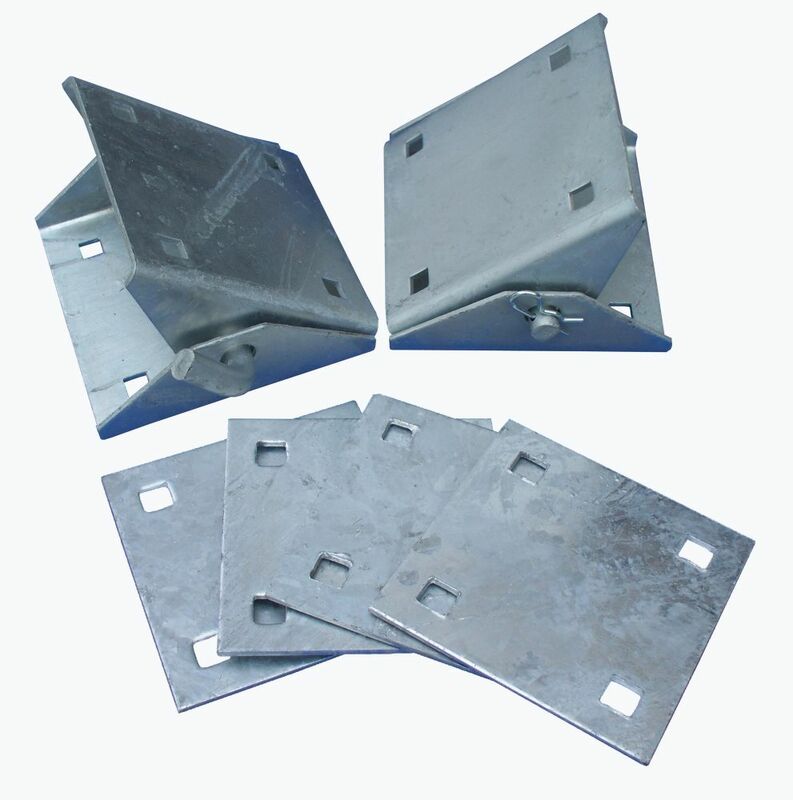 This stationary connector hinge kit includes 2 heavy duty connector hinges and 4 backer plates. Use for all dock and ramp connections. Hardware is 1/8 nominal hot dipped galvanized steel with 7/16" holes for 3/8 bolts. Kit includes all hardware, bolts not included. 2 x heavy duty connector hinges 5" x 5" x 1/8"
4 x Back Plates: 5" x 5" x 1/8"
This Multinautic<sup></sup> Dock Leg Holder Kit holds 1-11/16po. Galvanized Steel Posts on a Stationary Dock with the reinforcement plates included that are fixed to the corners of series 10000 or having holes at 3.5 po.center in center. This Kit includes (2x) Leg Holders 10005: 5po.x 5po. x 1/8po. for 1-11/16po. Leg Pile and (4x) Back Plates 10003: 2-1/2po. x 5po. x 1/8po.. This Dock Kit comes with 7/16po. holes. The reinforcement plate is used to distribute the pressure on the wood. This Heavy-Duty Floating Dock Inside Corner Kit is used to secure the corners of your dock together. It includes the matching components needed to build, repair or upgrade a dock system. It is used in the back of corner, pile guide, leg holder, or a connector hinge to reduce stress from bolts. Multinautic<sup></sup>, Your Canadian Dock Specialists since 1974! This kit offers you all the necessary Galvanized Steel Hardware, Fasteners and 2x Foam filled Polyethylene Commercial Floats to build a Ramp/ Semi Floating Dock with the following dimensions 8 x 12. This Semi Floating Dock can be added on to a new Dock or an existing Dock with Hinges (item 19133 sold separately and wood is not included). Plans and Instructions included will help you build a sturdy Dock of exceptional quality exceeding your expectations at a very affordable price. Stationary Dock Connector Hinge Kit This stationary connector hinge kit includes 2 heavy duty connector hinges and 4 backer plates. Use for all dock and ramp connections. Hardware is 1/8 nominal hot dipped galvanized steel with 7/16" holes for 3/8 bolts. Kit includes all hardware, bolts not included.